How are you doing with making new connections? What would happen to your leadership practice if you stopped strategic networking? Battilana, J. & Casciaro, T. (2013, July-August). The network secrets of great change agents. Harvard Business Review. Ibarra, H. & Hunter, M. (2007, January). 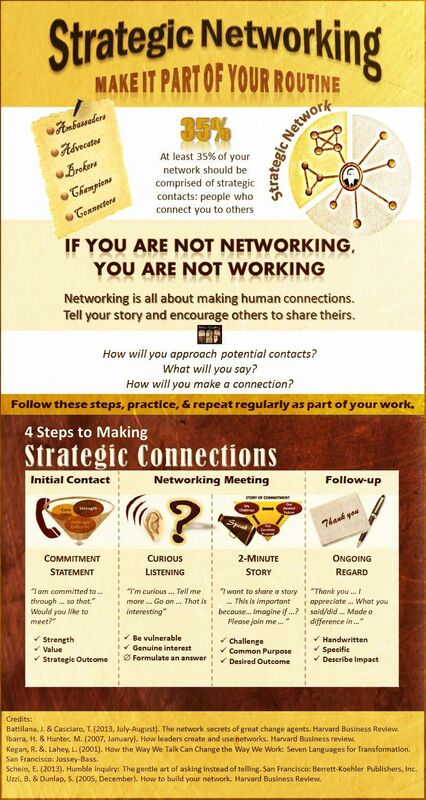 How leaders create and use networks. Harvard Business review. This entry was posted in Leadership, Networking, Relationships and tagged curious listening, humble inquiry, leadership, making connections, networking, ongoing regard, strategic networking. Bookmark the permalink.